Home » Our Blog » Chargeback Responses » What Transaction Modifiers Affect Digital Goods? There’s always a criteria when responding to disputes. The reason code explains what compelling evidence is needed while the issuer checks if merchants properly formatted all of the documents within their response. Any infringement could put yourself in jeopardy of receiving a chargeback. And that’s not the only requirements you should be aware of. Some reason codes will have what are called transaction modifiers. This is a crucial, underestimated element that impacts what evidence you should add to your response. We’re going to show which transaction modifiers affect merchants who offer digital goods and services. What is a Transaction Modifier? Think of a transaction modifier as a moderator for a reason code. It clarifies how merchants should respond to reason codes that consolidate more than one reason why a dispute was filed. As a result, modifiers inform merchants on what evidence is needed in order to address the dispute. Prevent disputes before it becomes a chargeback. Which Reason Codes Have Transaction Modifiers? If a reason code appears to be generic, it will likely have more transactions modifiers to explain the dispute and response method. If a reason code seems to be explicit, it will likely have less transaction modifiers to explain the dispute and response method. Currently, there are 28 transaction modifiers across all four card networks. MasterCard has the most with 22 modifiers. Before April 14, 2018, Visa had 19 transaction modifiers, which would have placed this card network in second place. However, Visa set its modifiers to expire once Visa Claims Resolution (VCR) had been launched. It now relies on its descriptions to explain how merchants should respond to disputes. E.g., what you see is what you get with Visa. What Transaction Modifiers Should I Be Aware Of? Basically, you should be aware of every transaction modifier. Especially those related to digital goods and services. We’re going to provide a list of all the transaction modifiers, its associated reason codes, and identify which digital merchants are most affected by these rules. Some modifiers will only affect one type of merchant while others will affect them all. In addition, you can also click on each reason code to learn how to respond with its related transaction modifier. This transaction modifier solely affects airline merchants who handle CNP transactions and offer digital goods. E-boarding passes are one example of digital goods. Here are the reason codes that have airline transaction modifiers. Digital goods is a more pervasive transaction modifier. This modifier affects all merchants who provide, distribute and accept transactions related to digital goods. This includes, but not limited to, any good that is bought, downloaded and stored on a cardholder’s device. The following reason codes will have a digital goods transaction modifier. MasterCard breaks up digital goods to two transaction modifiers. The card networks classifies both modifiers as Digital Goods Download and Digital Goods at or Under $25 USD. Here are the reason codes associated to each modifier. What [Other] Transaction Modifiers Should I be Aware Of? The following transaction modifiers only apply to MasterCard reason codes. Here’s a sample on how you should respond to each modifier. How to Respond: This transaction modifier applies to digital and goods that were purchased by a registered cardholder. This includes the authorized user of the customer profile. You must provide documentation that confirms this person is registered to purchase goods with a password. This is helpful, especially if you require this person to register prior to purchasing. Furthermore, you must provide one or more of the following evidence. You can show the cardholder or authorized user completed other undisputed purchases. This includes purchased that occurred prior to, or after, the alleged fraudulent transaction. You can also show the cardholder or authorized user completed the disputed purchase from a registered device and IP address. It’ll be great to provide details of the purchase. Or you can provide signed proof of delivery. It’s helpful to provide the email addresses that supported digital download delivery. Another piece of evidence is the cardholder and authorized user’s registered device and IP address. Make sure you show these elements completed the disputed transaction. In addition, you show the cardholder or authorized user was registered for the disputed goods or services. For example, registration for purposes of warranty or future software updates is sufficient. And finally, you can show proof of a fully enabled SecureCode transaction. Make sure you show that this transaction was used to register a PAN for future transactions. How to Respond: You must provide a statement that documents all of the following evidence. This must be accompanied with proof that shows you obtained authorization for a related transaction involving a partial shipment or the payment of a balance due. All of it must verify the authenticated ecommerce transaction. Here is the additional evidence you’ll need to provide. You must show the original transaction was a digital, secure remote payment (DSRP) transaction. Alternatively, you can show that that the transaction was initiated by a SecureCode. You need to provide the description of the goods or services purchased in the initial transaction. Also, make sure you include the date and authorization of the approval code for the initial transaction. And finally, prove that the initial transaction was not disputed. How to Respond: You can provide evidence that meet the following descriptions. The cardholder received the goods or services. The deficiency that led to this dispute has been corrected. How to Respond: You can provide documentation to support that the dispute is remedied or invalid. What Else Should I Know About Transaction Modifiers? Keep in mind that modifiers explain specific details related to a dispute, especially those related to generic reason codes. These become useful when card networks decide to consolidate more ‘reasons’ within its reason codes. For example, MasterCard Reason Code 4853 – No Cardholder Dispute has nine transactions modifiers. That means this reason code has 33.3% of all the transaction modifiers that are available among the card networks. And as we’ve shown above, two of 4853’s modifiers affect digital merchants. Those modifiers are Digital Goods at or Under $25 USD and Non-Receipt. Transaction modifiers may seem overwhelming at a first glance. But once it’s compiled into one resource, suddenly dispute management seems more manageable. And there’s a lot more we can offer along with an informative blog post. Here are some more resources that consolidate transaction modifiers, its associated reason codes and response tips all in one place. 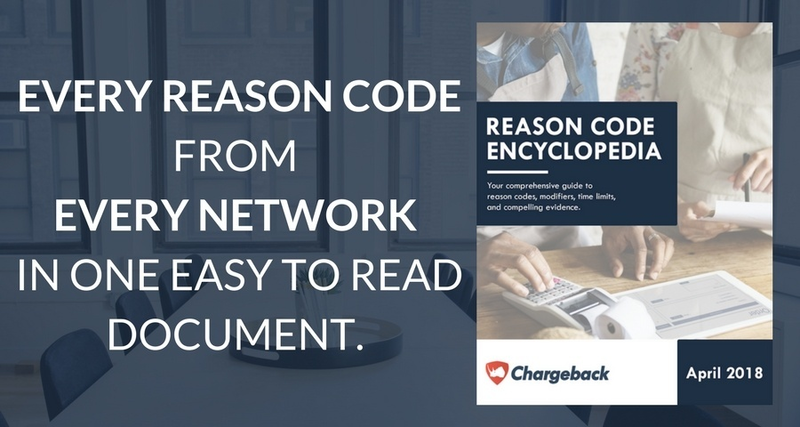 Our most popular resource not only has all of the card networks’ reason codes compiled into one ebook. It also offers the transaction modifiers, time limits and compelling evidence associated to a given dispute. The Chargeback Reason Code Encyclopedia also provides an in-depth explanation of Visa’s new dispute process. You can learn more about the VCR and more by downloading the Encyclopedia right here. Think of this resource as a countermeasure to the automation initiated by the card networks. The Chargeback App allows you to prevent disputes from becoming chargebacks. It allows merchants to provide issuers and cardholders with real-time order, usage and delivery data. As a result, you’ll be able to repurpose time for more important matters while reducing the likelihood of a chargeback. In addition, the Chargeback App automatically generates response templates and extracts all transactional data related to the dispute. This will give you more time to gather evidence and draft a compelling response. That best thing about the App’s auto-generation is that it generates response documents in accordance to the card networks’ rules. That includes transaction modifiers, and that’s one less thing you’ll have to worry while proving your innocence to the issuer. 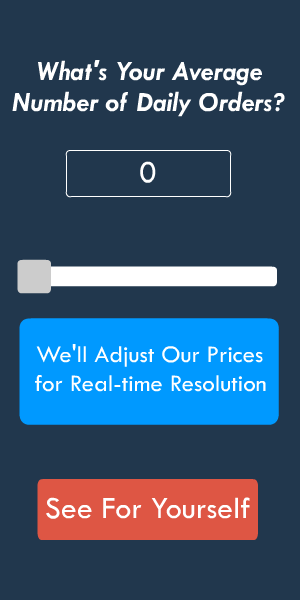 Feel free to contact us to learn more Real-time Resolution and the Chargeback App. You can also see our prices to learn about its benefits—and how much you’ll save with your current dispute intake. And finally, you can always request a demo in order to get a feel of Real-time Resolution.